WVI is delighted to hear that Dr Tom Ogilvie-Graham as been appointed the new CEO of African Wildlife Foundation. Tom was one of WVI's founding Trustees as he believed passionately that the conservation of endangered species needed more a timely veterinary input. Tom became a Patron when he moved out of the UK to work for the St. John of Jerusalem Eye Hospital. He has always had a passion for African wildlife and was even our vet on the original vaccination and minor injuries clinics that we helped Painted Dog Conservation with. 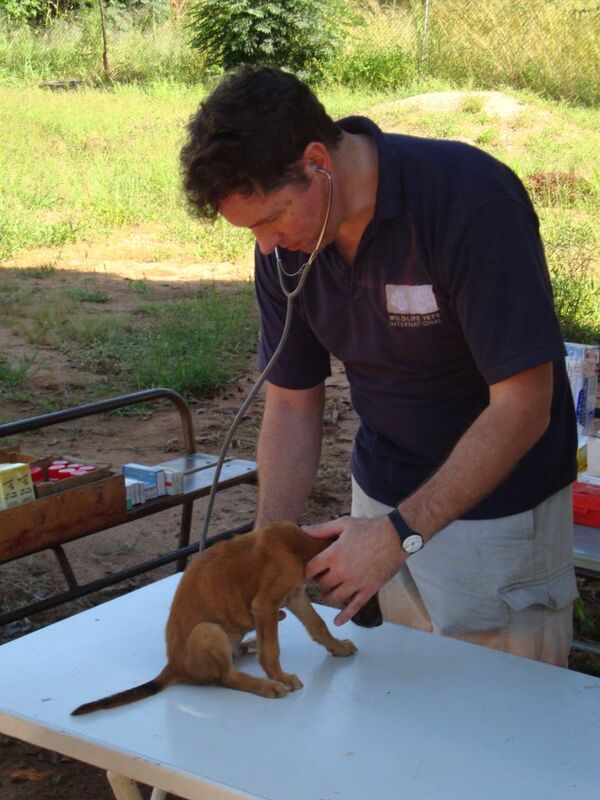 The picture shows Tom assessing the health of a puppy at the first of the clinics we ran. On the same trip he was 'lucky' enough to look at a wild painted dog that the PDC team had darted because it had a snare wound around its neck. We wish Tom the very best in his new role and perhaps we will see a new partnership develop! Find out more about Tom here and for the full announcement, please see here.